Details The smallest profile, lightest, and best field of vision available. 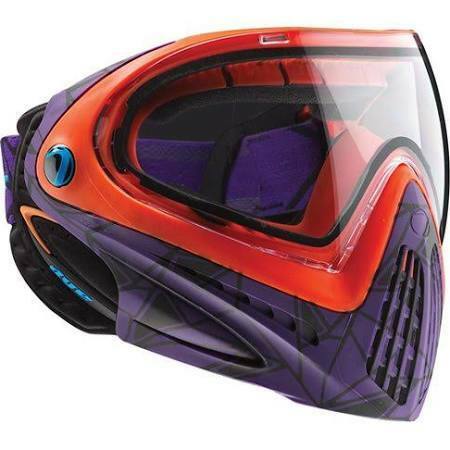 The Pro i4 is the apex of Dye’s long legacy of goggle engineering. The thermal lens leads the industry in optical clarity and provides a distortion and fog free field of vision regardless of weather. The i4 system also has a variety of lens options to match your lighting conditions. Tiger Teeth buckles allow you to adjust your Invision woven rubber strap for a custom fit. Tiger teeth are designed to bite down and secure the strap during rigorous competition. Using patented technology the i4’s precise blade angling and proven venting configuration, heat and moisture dissipates quickly. Scream Multi-Directional Venting makes communication with teammates effortlessly by carrying your voice farther. The anatomically correct i4 mask system offers the best in comfort for all facial contours.. The i4 is tested at twice the current impact ASTM standards. Dye’s proprietary dual stage foam combines open and closed cell foam technology. Dual stage foam is specifically designed to “sheet” sweat and moisture away from your face, providing an undeniably resilient boundary between your eyes and perspiration. The i4 offers more peripheral vision, than any other mask system on the market today. Movement is easier to recognize and provides a distinct tactical advantage. This is combined with our optically correct torodial impact lens that protects your eyes. This is coupled with HARDCOAT, a scratch resistant coating that protects both sides of the lens against scratches and minor abrasions, and the UV coating offers exceptional protection from the sun’s harmful rays. The i4 has a revolutionary patent pending rapid lens change system, allowing lens changes in ten seconds or less. It is as simple as pushing on each interior tab arm, then slide them forward and the lens is free to be removed. Ear protection is critical, but it does not need to be bulky. The i4 system features a compression formed earpiece that is soft, flexible and extremely lightweight. Cool Max® material in the ear protection has also been added to increase moisture evaporation.